I really like this base very much. If you have knit with our Classic Merino Superwash Sport, and liked it then you will be happy with this yarn as well. It is basically a slightly thicker version of that yarn. It has a 4ply construction with a balanced twist that is soft and springy. Of course it is 100% super soft superwash Merino wool, which is my favorite for dyeing and for wearing too. It takes the color so beautifully and feels great next to the skin. 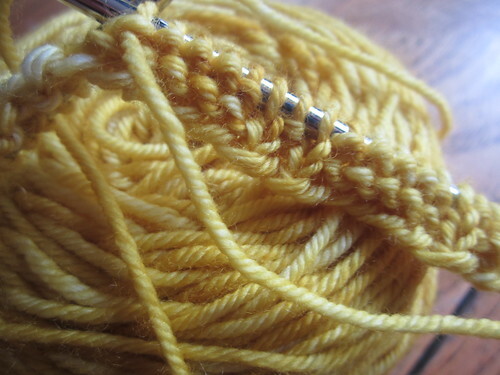 I found that it works up best for sweater gauge at 5-5.5 stitches per inch on size 6 US (4 mm) needles. For shawls and drapey items this is flexible because they won’t get the same kind of wear. I hesitate to recommend knitting merino wool yarns for use in sweaters that are knit in a looser gauge than the yarn is designed to be knit due to the fact that some pilling will result in friction areas. For some yarns it works alright to do that, like mercerized cottons for example, but soft wools and cashmere will pill if not knit to gauge. There may be some anyway, but not as much. I used the recommended 4 US needles for the brim and 7 US for the rest. I am making the M (17”) to fit a 22” head. Mine measures 21” but I decided to go up rather than down since I was between sizes. I am using the color Azalea. 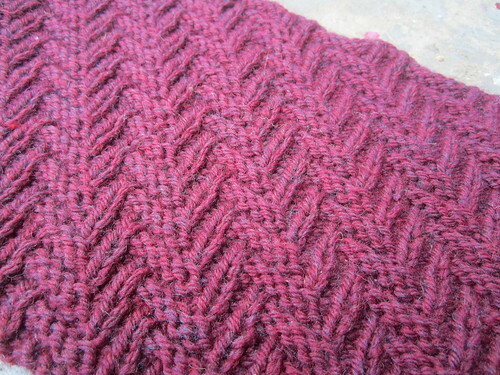 I also cast on for pattern I am writing up for that cowl I did back in January. Remember it? 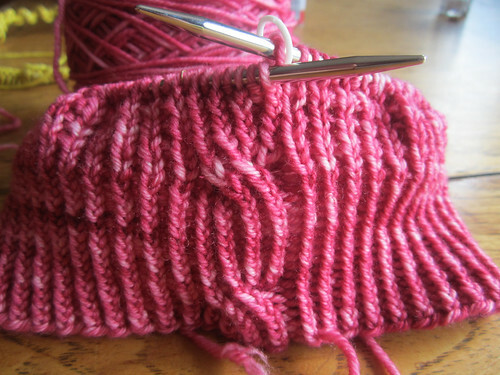 It is a very simple and interesting pattern to knit and I love to the cushy fabric it makes. You could alter the size to customize it. I like the larger circumferences too but this is a nice size for being close to the neck to give warmth without being too clingy. I don’t like turtlenecks for that reason. Mine measures about 24” in circumference and is about 8” deep. I decided to cast one in in the new yarn in Saffron. I will knit it the same size I made the original and write up the pattern. 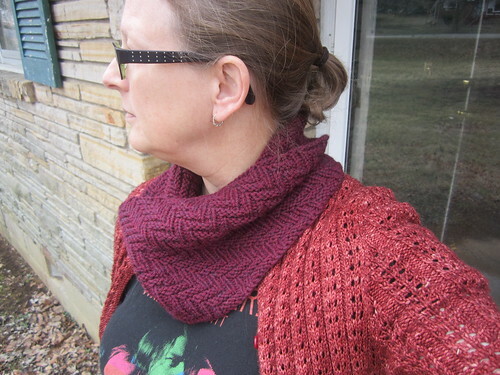 I will probably be offering this one as a free pattern with the purchase of a skein of the yarn in my booth.